To retain their usefulness, cultures that manufacture economically valuable products must be uncontaminated, viable, and genetically stable. Maintaining Cultures for Biotechnology and Industry gives practical advice necessary to preserve and maintain cells and microorganisms important to the biotechnology and pharmaceutical industries in ways that ensure they will continue to be able to synthesize those valuable metabolites. This book covers not just those strains currently being used but also those yet to be discovered and engineered. This text is essential for anyone working with cultures who wants to avoid the frustration of losing strains and needs to be able to devise and evaluate new strategies for preservation. The Biological Deposition Requirement. History and Evolution of Culture Maintenance and Preservation Techniques. Algae. Eubacteria. Actinomycetes. Fungi. Protozoa. Animal Cells in Culture. Human and Animal Viruses. Plant Germplasm. Plant Viruses and Viroids. 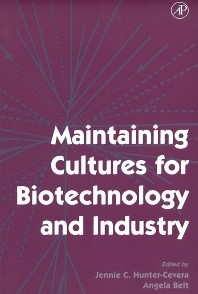 Characterization of Cultures Used By Biotech and Industry. Lawrence Berkeley Laboratory, Berkeley, California, U.S.A.
Blue Sky Research Service, Sonora, California, U.S.A.